San Francisco — At City College campuses across the city, 500 faculty walked picket lines beginning at 8 am today to protest the district administration’s unfair labor practices in contract negotiations. They were joined by their students and community supporters on behalf of a broad, accessible college, a vision competing with the college administration’s stated plan to “realign” the San Francisco Community College District by reducing course offerings over the next few years by 26%. No classes were held, as Chancellor Susan Lamb decided in advance of today’s one-day strike to close all CCSF buildings. 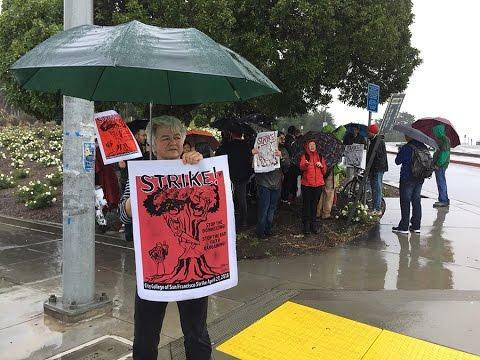 The picket lines, soaked by a brief but heavy morning rain, moved to the Civic Center campus for a spirited (and dry) rally at noon. There, nearly 600 demonstrators called for the administration to come to the table and negotiate in good faith with the people who teach City College’s students. Last week AFT Local 2121 leaders spoke as part of a coalition at a press conference announcing Supervisor Jane Kim’s plan to make City College free for its students. This forward-looking action stands in stark contrast to the college administration’s hoarding more than 25% of the district’s funds in reserves and its plans to downsize the college. Faculty are currently paid 3.5% below 2007 wages. The administration’s latest proposal offers primarily bonuses that would expire in mid-2017, leaving faculty only 1.5% above salaries from a decade ago. District spending on instructors, counselors, and librarians has declined 9% over a four-year period, while the budget for administrators has risen 29%. The Accrediting Commission for Community and Junior Colleges (ACCJC), which plunged CCSF into crisis with its illegal actions in 2012 and 2013, caused student enrollment to drop by a third. It is currently under fire from the state chancellor’s office, the California Community College Board of Governors (BOG), and the U.S. Department of Education. The ACCJC has improperly inserted itself into the bargaining process, one of the issues noted in the Unfair Labor Practice filed by the faculty union. Resolutions of support for the strike have streamed in over the past few days. The CCSF Associated Students, the California Faculty Association (CSU), the Chinese Progressive Association, Jobs with Justice, United Educators of San Francisco, and the San Francisco Labor Council, among many others, have sent solidarity messages. Members of the San Francisco Board of Supervisors have weighed in on the side of faculty. At a press conference held on Tuesday at the Chinatown/North Beach campus, San Francisco Supervisor Aaron Peskin said, “Faculty have stood with me on many occasions, and I am honored to stand with you.” And President of the Board of Supervisors London Breed walked today with faculty at the John Adams campus. The San Francisco Board of Supervisors will be considering a resolution of support for the strike. According to Hillary Ronen, chief of staff for Supervisor David Campos who sponsored the resolution, “We have seen many changes in San Francisco these past few years, but City College continues to play a vital role in training our workers and giving people a shot at a better life through education. We stand by the faculty at City College who do this important work and their students who make this city the diverse and vibrant community that it is.” Ronen spoke at the noon rally, along with Jane Kim. Prior to the strike the faculty union filed Unfair Labor Practice charges with the state Public Employment Relations Board, on the grounds of bad faith bargaining by the college administration and its attempts to skirt the negotiations team with a recent salary proposal, “direct dealing” in the language of collective bargaining. The one-day faculty job action, led by AFT Local 2121, was the first in the eight-decade history of City College of San Francisco, and only the fourth ever held on a California community college campus. AFT Local 2121 represents more than 1500 full- and part-time faculty, librarians and counselors in the San Francisco Community College District. It is affiliated with the California Federation of Teachers, which represents more than 25,000 faculty in California’s community college system.